At Little Village Academy in Chicago, a public school, students are not allowed to bring their own lunches from home unless they have special dietary needs or food allergies. Though the decision has seen a lot of media coverage this month, the policy was actually created six years ago after the school’s principal saw students bring “bottles of soda and flaming hot chips (to eat for lunch),” according to the Chicago Tribune. 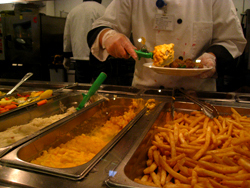 Students must eat the meals served in the cafeteria or go hungry. Unfortunately, this means money, both the federal government’s and parents’, and food are going to waste. Students take the lunches served in the cafeteria, but don’t like them and throw them away. (By the look of the food in this photograph from the Chicago Tribune, I don’t blame them.) The district still has to pay its food provider for these uneaten lunches, as do the parents whose children don’t qualify for free lunch. And who is to say a lunch a mother or father packs for their child is guaranteed to be less nutritious than lunchroom slop? Last time I checked, good ol’ PB&J was relatively healthy and probably more nutritious than a lunchroom hamburger and fries. The intentions of the school’s principal may have been good, but unfortunately for her, there is not a one-size-fits-all approach to raising a child. Not all parents send their children to school with a can of Pringles and a bottle of Coca Cola, and if they do, so be it. Taking the right of a parent to raise his or her child and feed them what they wish is crossing the line.